Committed and responsible to fair trade in diamonds. Any loose or self-mounted natural diamonds sold by DCSA have been sourced and purchased from legitimate sources which are not involved in funding conflict and are in compliance with United Nations resources. DCSA hereby guarantees that all diamonds sold are conflict free, based on personal knowledge and/or written guarantees provided by the supplier of such diamonds. Our loose diamonds undergo strict colour, clarity and quality grading by world leading laboratories such as the GIA (Gemological Institute of America), EGL (European Gemological Laboratory), HRD (Hoge Raad Antwerp), IDL (International Diamond laboratory) , DIA (Diamond Laboratory Johannesburg) and more. We refrain from using any grading laboratory that is involved in over grading or manipulation of grades. Our in-house diamond graduates pay close attention to the consistency and accuracy of such reports. DCSA takes full ownership over this process. Each loose diamond sold comes with an independent grading report by the GIA, EGL, HRD, IDL or DIA. By using independent reputable grading laboratories, DCSA ensures that no unjust practises are followed when gem grading and pricing is done. This to protect and honour the interests of every DCSA customer. With the world renown Premier Cullinan Diamond mine on our doorstep, DCSA delivers a standard of premier quality diamonds direct to the public at source prices. 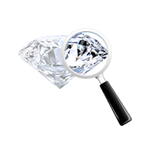 DCSA offers you one of the largest online collections of pre-selected loose diamonds. Due to its unique infrastructure, DCSA enables diamonds direct from source, whether directly involved in its mining or sourcing. Each diamond offered by DCSA is best priced and unmatched when comparing apples with apples. If you can find a cheaper diamond of similar quality elsewhere, we will match or better the price.